Friends have been rightly concerned for my health on a pound shop diet. Hell, I’m concerned. So I have started doing some research into Scurvy. 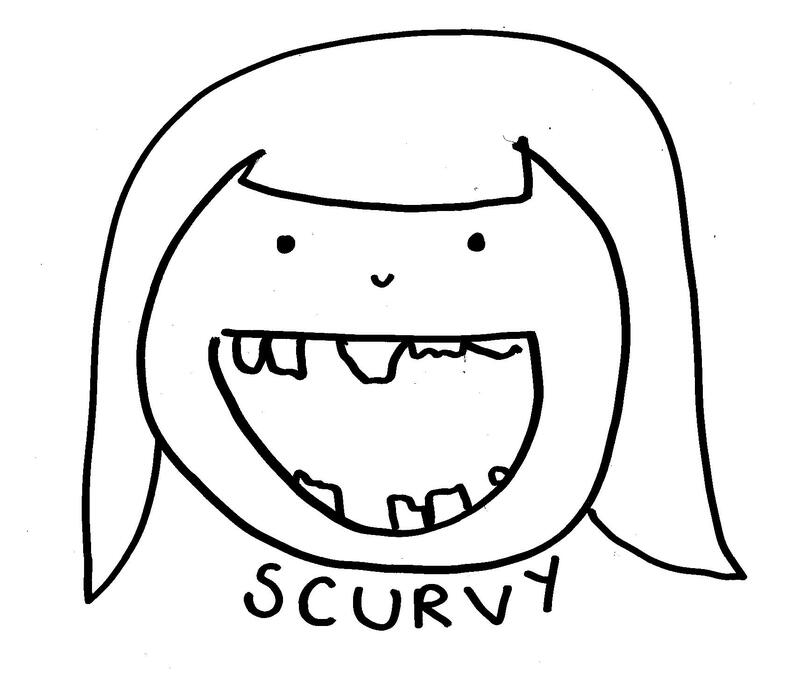 Yes scurvy the condition that is rarely seen in modern western society but might be resurrected in Holloway. Basically it is a deficiency disease that results from insufficient intake of vitamin C. Sailors were susceptible to it as they were on ships for long periods without fruit or vegetables. They were cured with barrel loads of citrus fruit. Are you ready for the symptoms? Those of a sensitive nature may wish to skip the next paragraph. Scurvy leads to the formation of liver spots on the skin, spongy gums, and bleeding from all mucous membranes. The spots are most abundant on the thighs and legs, and a person with the ailment looks pale, feels depressed, and is partially immobilized. In advanced scurvy there are open, suppurating wounds and loss of teeth. Oh. My. God. I think I could manage without my teeth but seeping wounds? Interestingly, Guinea Pigs also lack the gene that makes vitamin C and so can contact scurvy if not supplemented with the vitamin in their diet. Hey, I found a way to link to blogs. You just have to go to the page, go the upper right hand corner under Blog Info and click on Add to Blog Roll. The link will show up on your front page. 🙂 You’re on mine! !